I just saw this commercial. I think it is super awesome and I had to share it with you! 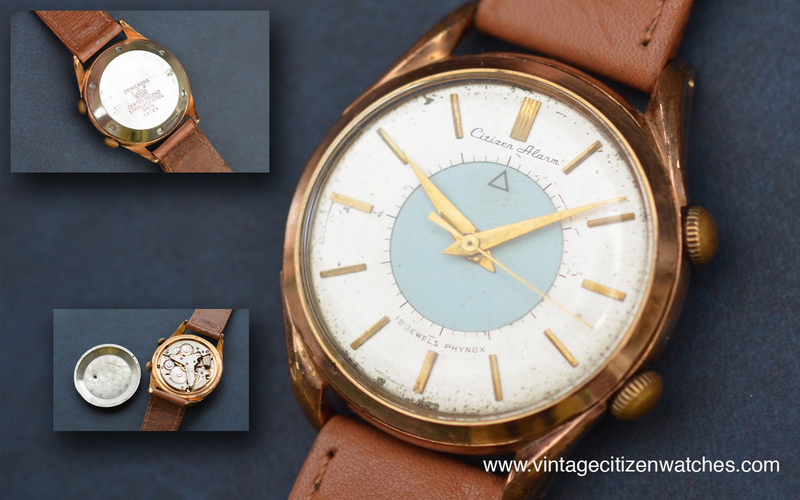 Read more about the historical Citizen watches HERE. Later edit: Unfortunately Citizen Co. got the wrong watch in their commercial. The first water resistant watch didn’t have a date as the one featured here dropped into the aquarium. Read more about the REAL first Japanese water resistant watch HERE. – The Parawater! Do you want a dress watch? One that is an important part of Citizen history? Maybe one that is really rare? 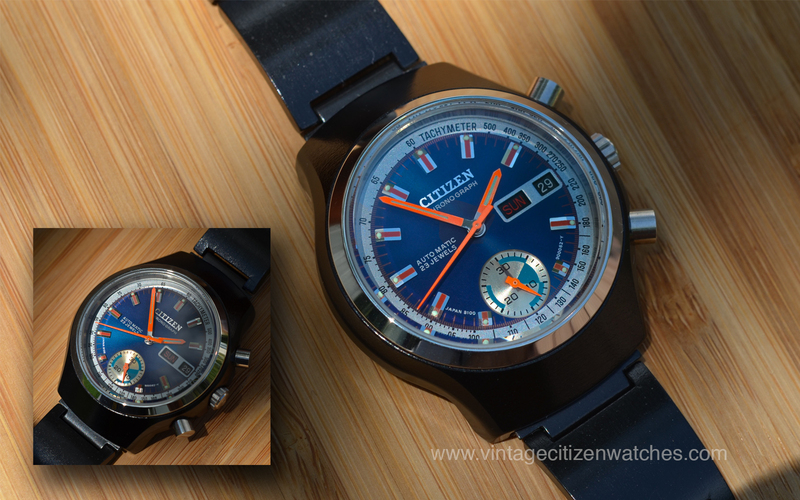 Look no more, here it is the awesome Citizen Auto! Citizen well known Jet movements are often believed to be the earlier automatics that the company produced, prior to the swinging central mounted rotor, BUT, in fact that is not true. 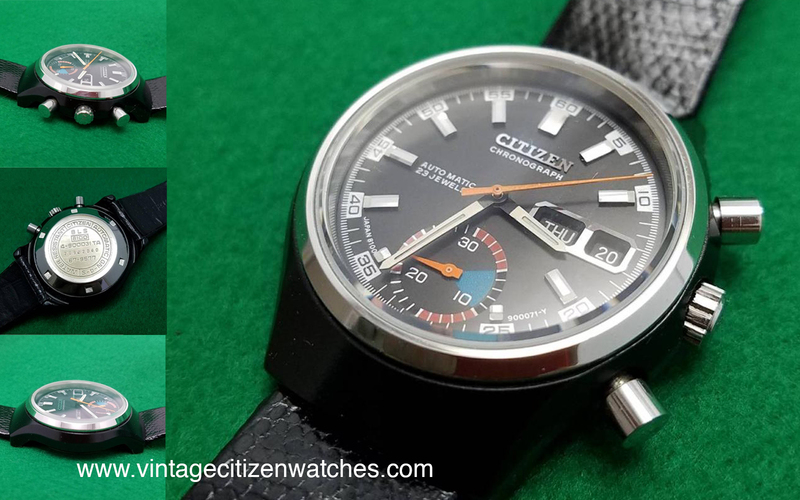 Well, even before the Jet, Citizen had a traditional, more common type automatic movement and this is the watch to have it! The case is made of stainless steel, and so is the screw in caseback making it water protected. Overall it has a clean design, with applied hour markers, three hands, central sweeping seconds, no luminous material. Nothing fancy about the design, just a clean elegant look. But, let’s take the case back off! Here is the movement! 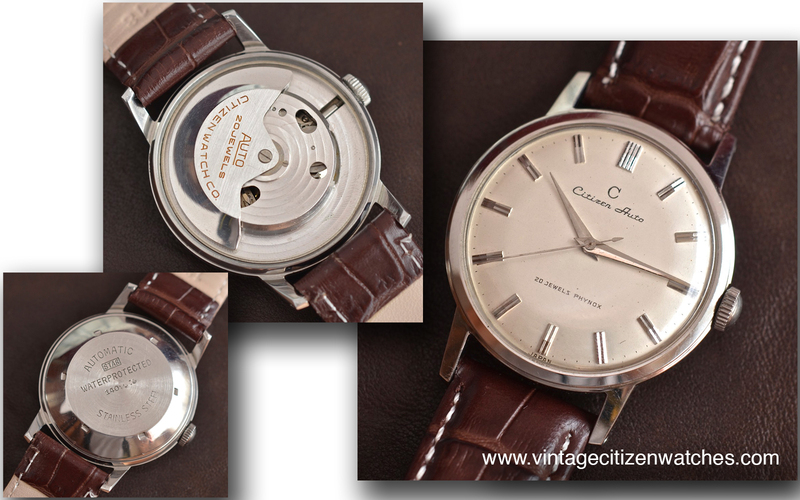 And that is the first automatic movement Citizen ever produced, calibre 3KA. 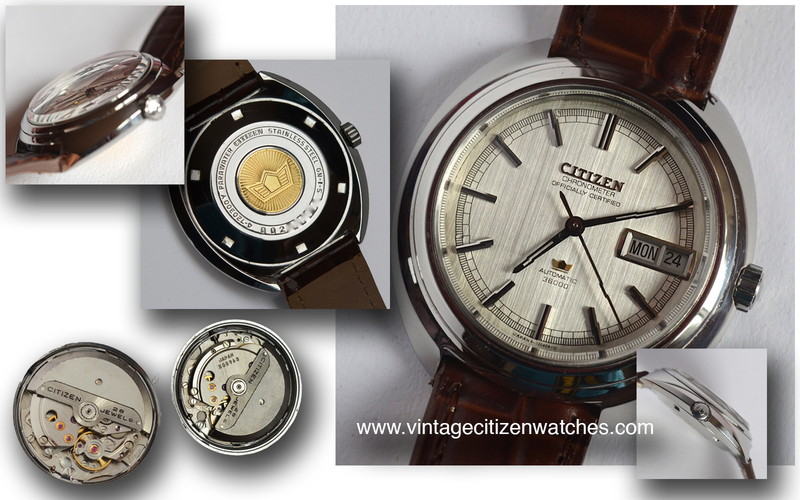 Citizen had to come up with a self winding mechanism as a response to the first Japanese automatic made by Seiko in 1955. 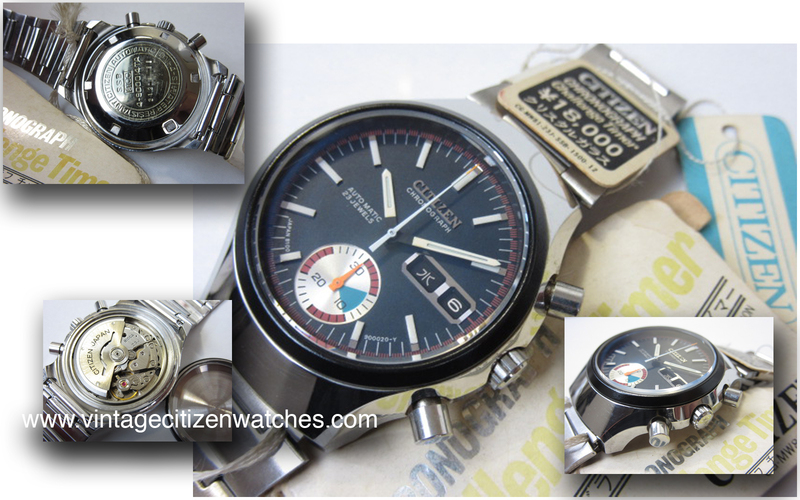 At the time Seiko was the main competitor and most of the time ahead of Citizen, so the company needed to keep up. They made this starting from May 1958 for only about 3-4 years (not sure about this). Citizen stoped making it because of the introduction of the fabulous (in my opinion) Jet movements that were made from ’61 to ’67. Read about Jets HERE. So, here is the Citizen AUTO! In fact it has a manual wind base movement that was added a large bridge that covers almost all of the inner parts. On this bridge the swinging bidirectional winding weight was placed so the watch became an automatic. Cal. 3KA runs at 18,000 vibration (5 vibration/sec) and has a power reserve of about 35 hours. It can also be winded by hand. Just give it a few turns of the crown and the seconds will tick away easily. 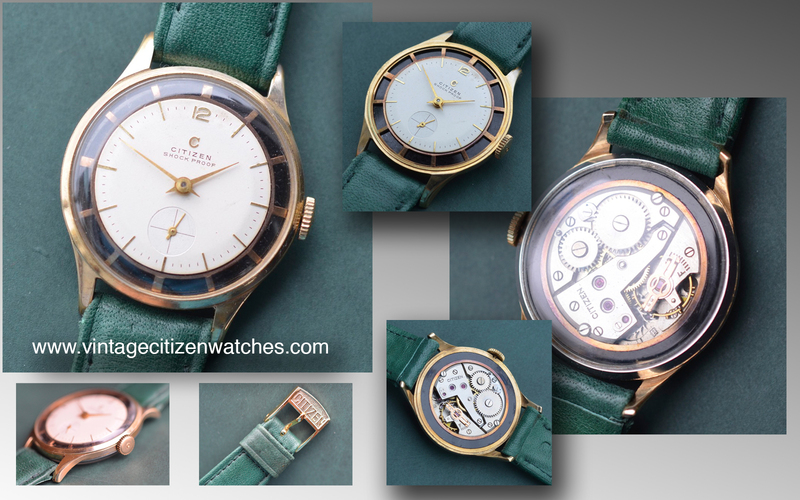 Read more about other important Citizen watches HERE. This time the watch presented is not a diver, neither a fly back chronograph. Not a hi beat movement and not a Chrono Master but what a beautiful timepiece it is! What makes it special is the fact that it has a transparent casback for an easier way to look at the movement. It was made around 1960? The case is gold plated and has a two acrylic crystals, one on the dial side and one on the movement side. This way, it makes this watch the oldest I have seen with a display back. You can see an interesting Leopard pocket watch with a display back HERE. Removing both crystals we can have a better look at the beautiful dial and movement. The dial, as well as the movement, is placed inside a black disk, with hour markers on the dial side. This gives it a great contrast to the white simple center. The hands are also golden and the small seconds are eccentric, at 6 o’clock. The “C” logo and the hour markers are applied. The same logo can be found on the winding crown. To compliment the watch, a genuine vintage green leather strap with a gold plated Citizen buckle was used (not sure if the right one for this piece but a really good match). The movement is a Citizen calibre H that I don’t have much info on so far. Hopefully in the future I will be able to add more facts about this watch, meanwhile let’s enjoy the pictures and the way the movement works through the clear case back. In fact it is not really a “Leopard” but it is equipped with the same movement that can be found mostly in the Leopard range. 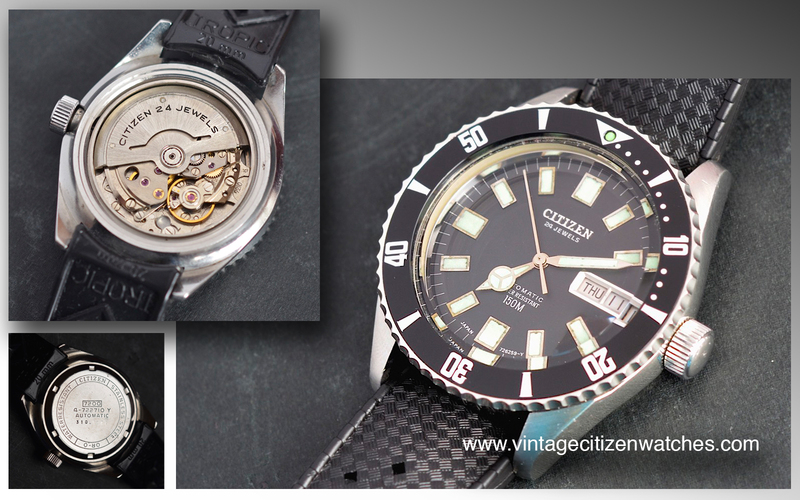 Also, the case style is the well known one used by Citizen in their 150m divers. What can I say, the perfect combination of style and functionality. 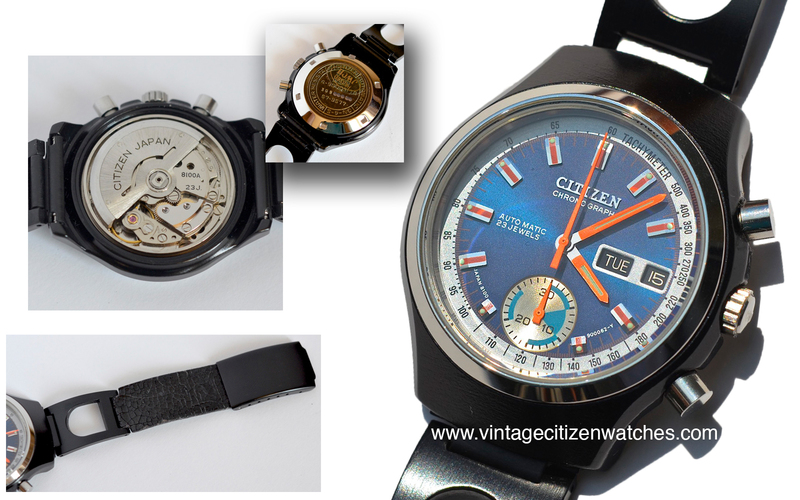 This is the (October 1972) Citizen 150m day-date diver model 4-722710 Y. The case, as stated before, is similar (not exactly the same though) with other 150m divers. Read about similar divers HERE. It has the same 40mm diameter, brushed top surface, polished sides, large unsigned screw in crown, screw in case back. The lug width is 20mm. There is also a bidirectional friction type bezel. Again, the bezel has a few variation among 150m divers. It is important to pay attention to this because a lot of these pieces come with aftermarket bezel inserts or wrong ones. I wrote an article about one particular fake & real inserts HERE. The crystal has a flat surface and it is concave on the inside. Of course, the water resistance is 150m. 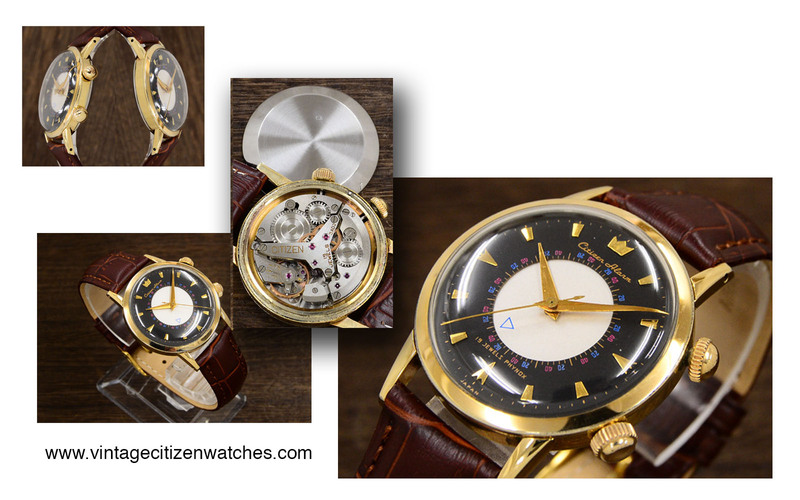 The interesting feature of the watch is the automatic movement, Citizen cal 7210, 24 jewels. It works at 28,800 bph, 8 ticks per second, 4 Hz. It can be hand winded too as most of the Citizen movements do. Because the watch has this calibre, it displays the date as well as the day of the week. The dial is black, with raised hour markers, logo and day-date frame. The printing is white. On the bottom it is also printed the dial code 726257 Y and Japan. The hands are similar all across the range, with slight variations in size and shape. In this case the sweeping second hand is straight without the luminous dot as others have. I have seen a variation of this exact model with a black day and date wheel and that one has a second hand tip with a luminous ball. 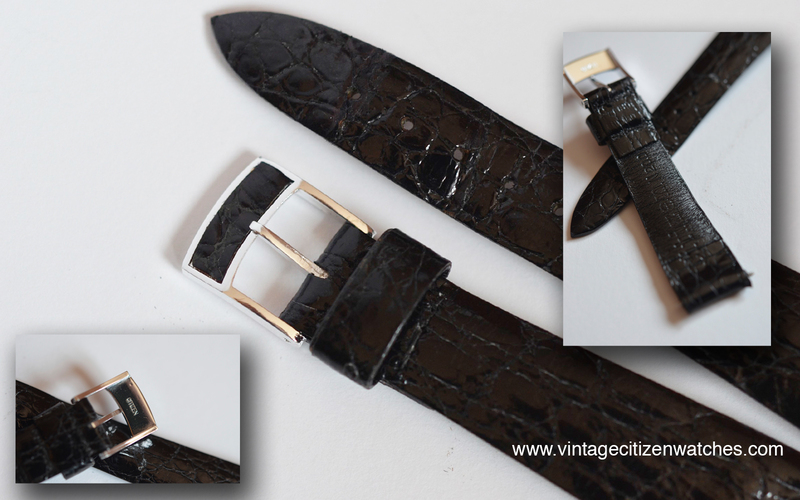 The strap is a curved end Tropic rubber one that fits the watch nicely and gives it a lot of personality. Lovely watch to have and wear. 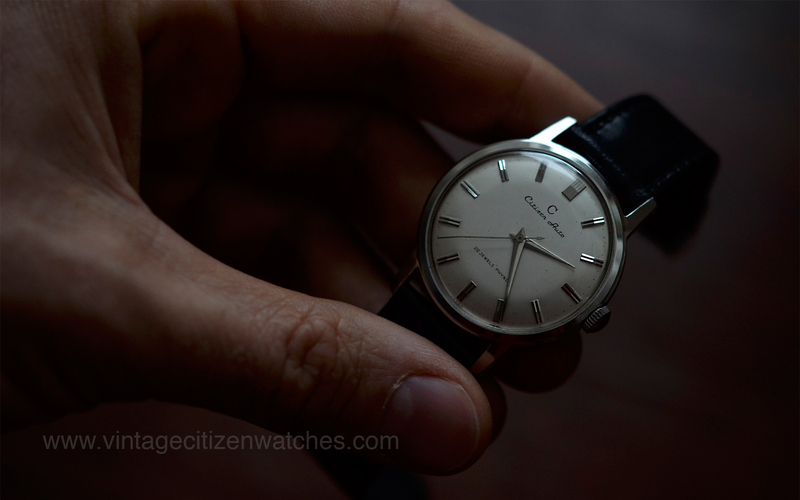 Japan had something similar and so did Citizen with this model. It is a gorgeous piece powered by a very accurate movement. 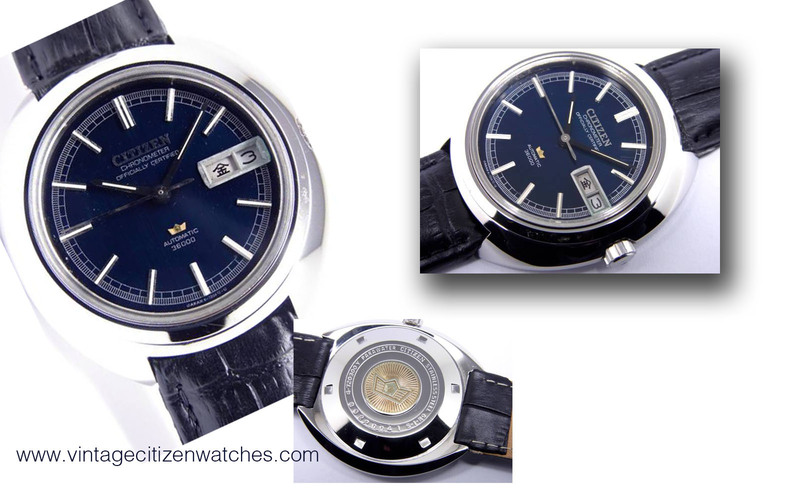 This particular watch, model 4-720300 Y , was made in February 1970 and it is marked Parawater. So, let’s start with the movement! It is the Citizen calibre 7230 based on 72xx calibre that is found in most of the Leopard range. Read about Citizen Leopard watches HERE. It is an automatic with 28 jewels, day and date, hacking seconds and it is running at 36000bph. 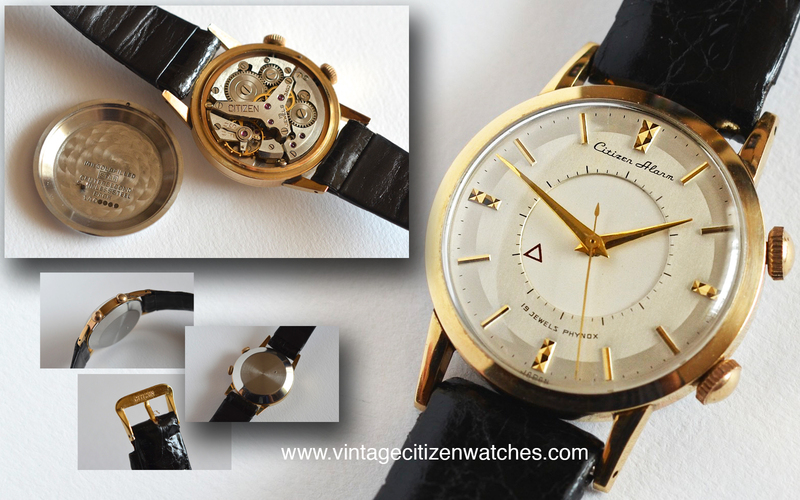 It is operated by the “C” signed crown that sets the time, day and date, and winds the movement. It is engraved with it’s own serial, like most of the special movements Citizen produced. 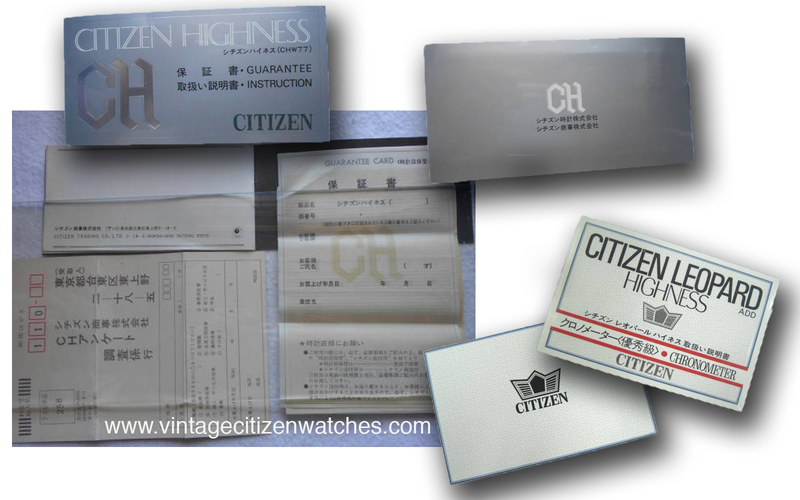 All this makes it a special piece and very accurate; after all it is Citizen Chronometer Officially Certified, the first generation of what later became Citizen Highness. In fact this one is called Leopard Highness. Such a special movement needs a special, stainless steel, all polished cushion shaped case. The caseback has it’s own special logo, a gold inlay medallion. The same logo is applied on the dial too. Talking about the dial, well, it is awesome! It’s simple, clean, with a vertical grain brushed surface. It has applied hour markers, logos and day-date frame. All the rest is printed in black. The skeleton hands are also black and so is the simple sweeping second hand. The entire face is protected by a mineral faceted (9 surfaces) crystal that plays with the light making it look really special; well after all it really is!